Kirsten and Travis, with my niece, Brianna in front. Ever since my parents moved back to Michigan, 23 years ago, Kirk, Kirsten, Travis and I have been spending most Christmas Eve's with my parents. 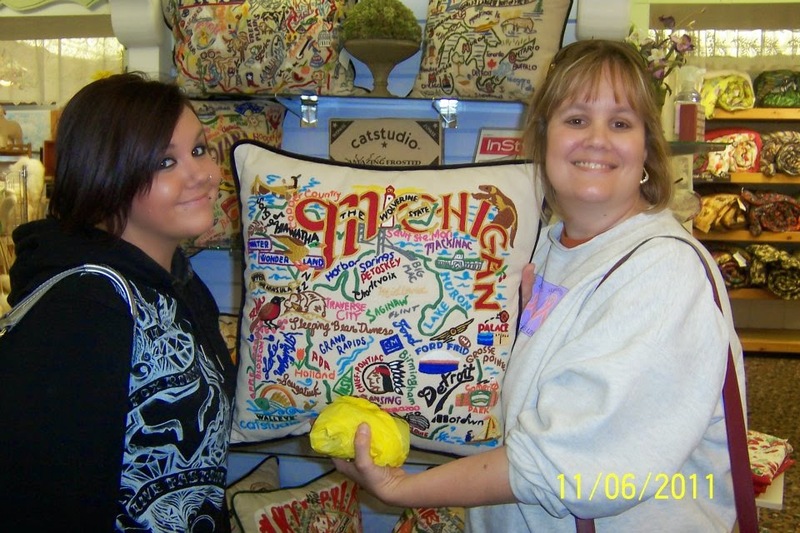 This has been a tradition for such a long time that when we don't go to my parents home in Portage, Michigan it is odd. The family has changed over the years, but the traditions haven't. My mother, who is an excellent hostess, doesn't feel like she has been successful unless we have a sit down dinner. Her go to Christmas Eve dinner is steak, baked potatoes, green salad, watergate salad (for Travis), strawberry jello salad (for Kirsten) dinner rolls, and homemade Christmas cookies and ice cream for dessert. One would think you wouldn't serve anything else with all that for dinner, but my mother doesn't think that way. She sets out Christmas m and m's, candy canes, cashews, and peppermint patties in her various Christmas candy dishes. Some years she will have appetizers, shrimp, cheese and crackers, tortilla chips and dip, and more. For years my husband would leave with pains in his shoulder from eating so much. He has learned over the years to pace himself. One of the years we didn't have a steak dinner, just snacks. The wings aren't even on the table yet! The family felt that a sit down dinner was too much work for my mother and we have tried to get her to just go the light snack/appetizer route. My mom feels that is more work than dinner, so she went back to dinner and still has the appetizers. I now know where I get my need to have an abundance of food at holidays. One of the fun parts of the evening was when my mother grabbed grocery bags and tried to give away all the leftovers. 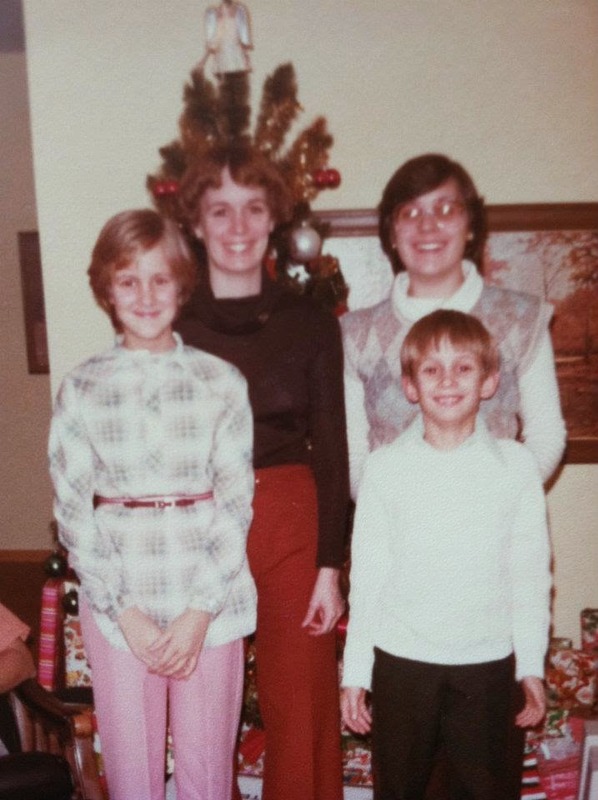 My sister, Nancy, lived in Michigan for awhile and it was funny to watch us put things in each other bags, especially the candy canes. After dinner, we would open gifts. One of the gifts my parents have given their grandchildren since they were born were Hallmark granddaughter or grandson ornaments. My mom said when they graduated from high school she would stop, then it was age 21, now she says as long as she is alive she will continue to buy them. 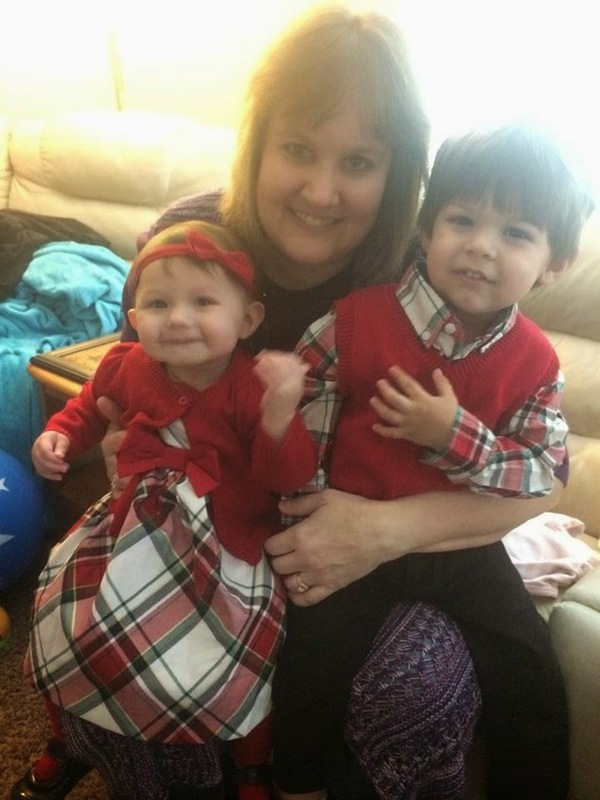 I think it is a wonderful tradition that her grandchildren will treasure for years to come. I gave my daughter all of her ornaments the year she got married. My tree seemed so bare that year without them. This fall, I took my son's ornaments to him. I think I am going to need to buy more ornaments. I appreciate that my parents have kept the tradition of our family getting together at their house for Christmas Eve. I have many fond memories of this special time. 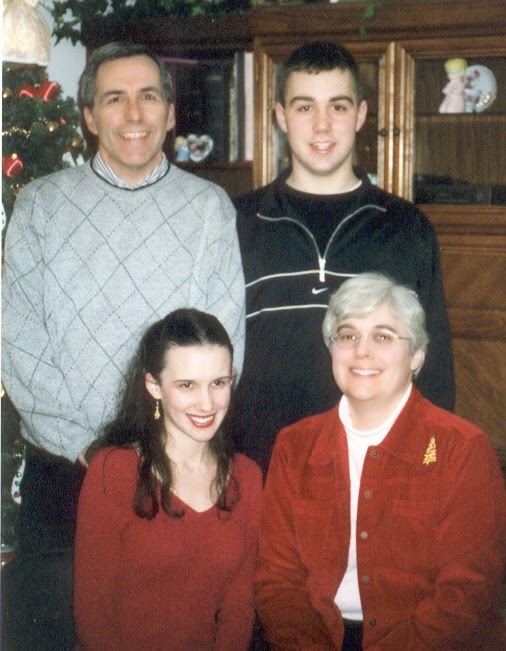 Here are a few more pictures of the Glover Christmas Eve tradition through the years. Sorry, Grandpa we cut you out of it. Grandma and Grandpa with the grandchildren. Pictures in front of the tree are mandatory. and it was just my family and my parents. 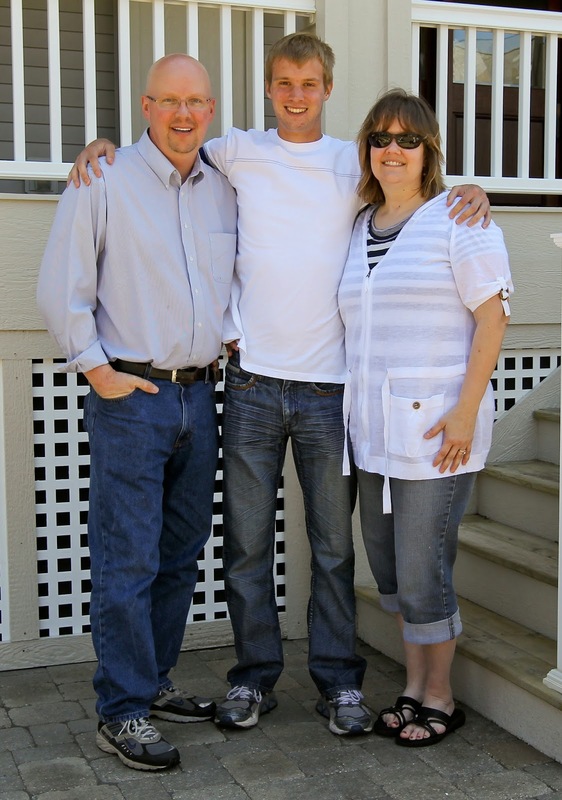 Our son-in-law, Chase, was welcomed into the family. Then, our soon to be, daughter-in law, Alayna, joined us. And last but not least, our grand pup, Ella. Her first Christmas there was one to remember. I may have fed her too many treats before we left our house. 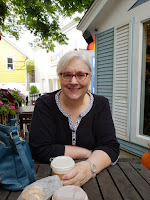 My younger sister, Nancy, is celebrating a birthday today. Happy Birthday, Nancy! We are nine years apart in age. I remember being excited when she was born. I babysat a lot for her when I was in high school. She was eight when I left for college. 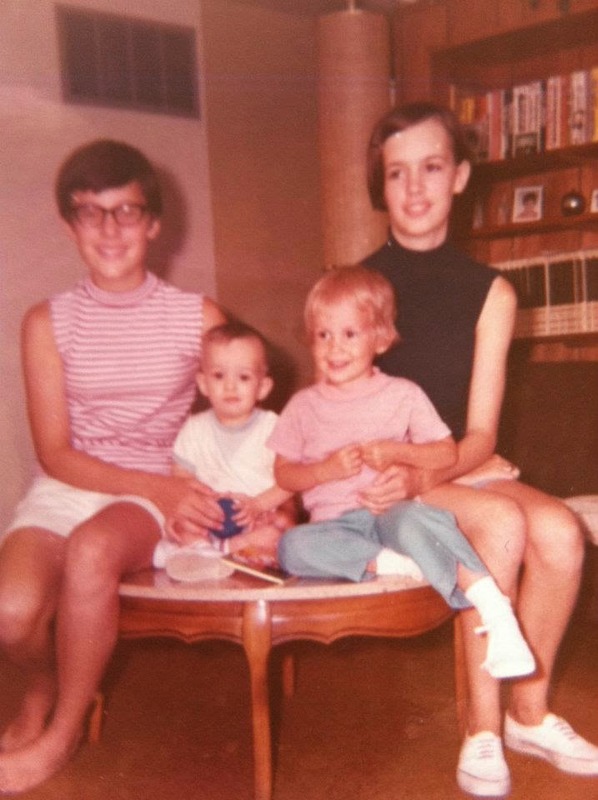 My parents, Nancy, and our brother, Neil, moved to Texas a few months after I was married. We have been apart for a large part of our life. 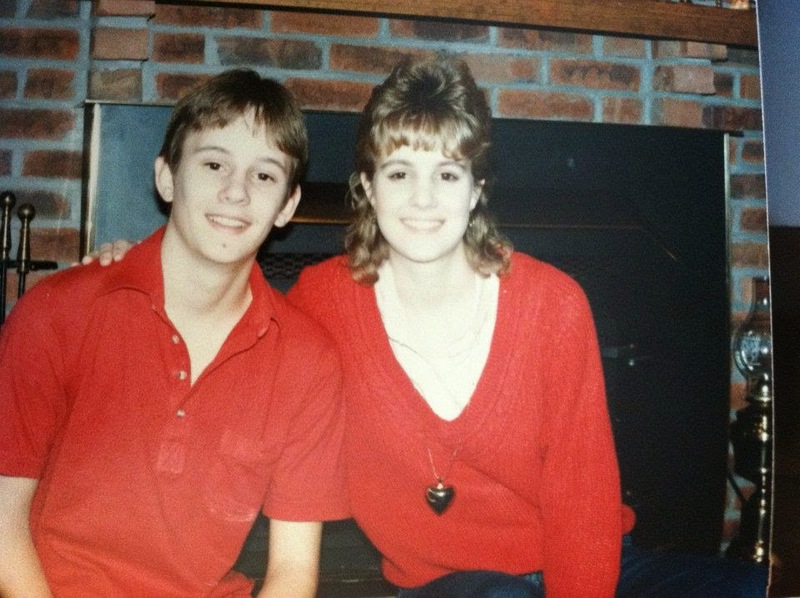 She moved back to Michigan after she was married and we were able to spend holidays together. She is now living in Washington and I haven't seen her since last year. Although distance has separated us I think of her often. I hope she is celebrating in style! Have a happy birthday, Nancy, you deserve it. 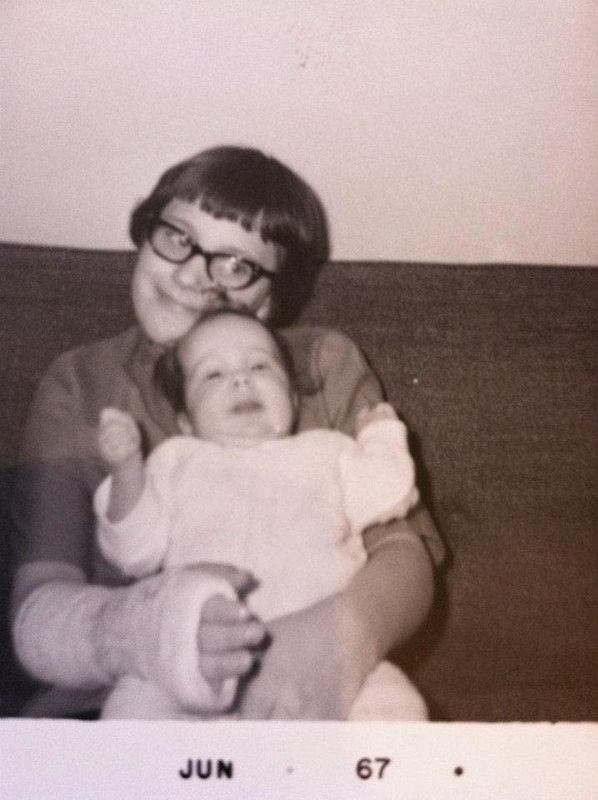 My newborn sister, Nancy and I in February 1967, she was two months old. A bridesmaid in my wedding, third from the left, in 1981. Source: Genealogical Society of Washtenaw "MI" County, "State of Michigan 1845 Census for Sylvan Township," Family History Capers newsletter, Volume 6 (April, 1983): p98; PDF images (http://washtenawgenealogy.org/), Available in Members Only Section under Capers Archive. I have very early pioneer ancestors in Washtenaw County, Michigan with many arriving in the 1830's before Michigan was a state. Recently, I was reading the April, 1983 edition of Family History Capers when I saw a transcription of the 1845 Census for Sylvan Township, Washtenaw, Michigan. It is a fairly short list and it wasn't hard to see familiar surnames. Three other Glover's were listed, Lorin and two William's. I need to do more research to see if, and where, they might fit into my family. Once I read the list I found an image of the 1845 Sylvan Township census at SeekingMichigan.org. The only information recorded on this census was a list of adult males over the age of 21. Seeking Michigan is a great resource for Michigan records. If you have Michigan ancestors it is a must see website. Amos C. Blodget was buried in Highland Cemetery, Ypsilanti, Washtenaw, Michigan. My husband and I visited this cemetery this past summer and spent time photographing gravestones that were related to the Glover family. Amos C. Blodget married Sarah Salisbury Glover, the daughter of Charles Williamson Glover and Mary Ann Powers. Sarah Salisbury Glover was the granddaughter of Alexander Glover and Sarah Salisbury, my fourth great grandfather. Amos C. Blodget was a Michigan legislator from Washtenaw county during the years 1857-58. He was elected to other local offices in Ypsilanti, Michigan during his career; serving as Justice of the Peace and Prosecuting Attorney. He spent many years as an attorney and specialized in insurance law later in his career. Amos C. Blodget was born in 1822, possibly in Vermont. He died 3 September 1906 in Nashville, Davidson, Tennessee, United States. Amos is buried in the Blodget Family Plot in Highland Cemetery, Ypsilanti, Michigan, Lot 19 and Block 100. 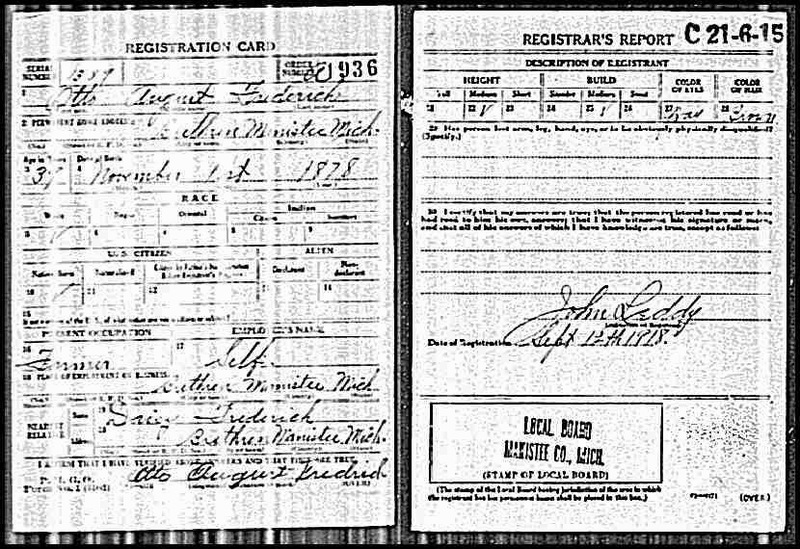 Source: "World War I Draft Registration Cards, 1917-1918," [database on-line], Ancestry.com (www.ancestry.com : accessed 18 October 2011), Entry for Otto August Frederich; United States, Selective Service System. World War I Selective Service System Draft Registration Cards, 1917-1918. Washington, D.C.: National Archives and Records Administration. M1509, 4,582 rolls. Imaged from Family History Library microfilm. Otto August Fredrick, my grandfather, registered for the World War I draft on 12 Sep 1918. I found two different spellings of his last name on this record. The first spelling was Frederich and his signature was Fredrich. The original surname was Fredrich. His father, Johann August Fredrich used that spelling thoughout his life. In my writing of Otto I use Fredrick, which eventually became Fredricks. I don't know when the spelling was changed from using an "h" at the end of the name to a "k" and then adding the "s". I enjoy finding the World War I draft registrations for my ancestors. The detail the record provides is helpful to genealogists. It is a record not to be overlooked in your research. Although, I didn't learn much new from Otto's record, I still find it helpful. The record provided the birth date, place of residence, occupation, nearest relative (his wife, Daisy Fredrich), and physical description. I enjoyed reading the description of my grandfather because I don't remember knowing him without gray hair, it was brown on this record. He was medium height and medium build and had gray eyes. That reminds me of what I remember him looking like. I use the draft registrations to add facts to my Roots Magic database. I added Military, Occupation, Residence and Description to Otto's record. Henriette Fredrich Zobel is becoming one of my favorite Fredrich ancestors to research. It is through my research of Henriette, my great grand aunt, that I have been able to find any information about the Fredrich's in Germany. Henriette's marriage information provided me with the name of her parents, Christoph Fredrich and Susanna Koenig, my second great-grandparents. Henriette's brother, Johann August Fredrich, is my great grandfather. I haven't learned anything about his parents in my research of him. 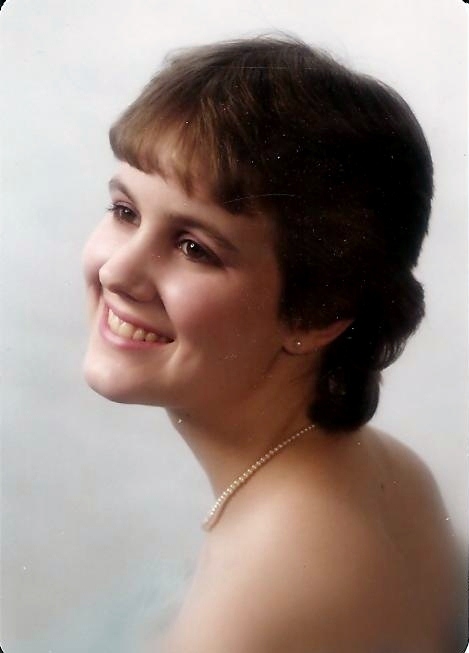 Henriette Fredrich Zobel's obituary is transcribed below. I loved the information provided in this obituary. It even provided the date of when she arrived in Manistee, Michigan where she lived the remaining years of her life. Henriette Fredrich married John Zobel in 1862, near Nakel, Posen, Prussia. He is the Mr. Zobel listed in the obituary. It isn't often one sees the word 'nonagenarian'. Do you know the meaning of the word? It means someone who is between the age of 90-99. Henriette Fredrich Zobel was 94years old, just weeks shy of 95, at the time of her death in 1929. Genealogists often use blog posts as 'cousin' bait. I am guilty of that too. This is one of those posts. I would love to connect with a Zobel descendant. Henriette was the second oldest of Christoph and Susanna (Koenig) Fredrich. The oldest child was Wilhelmine Fredrich. Wilhelmine never left Prussia. I have been in contact with a descendant of Wilhelmine, which has been wonderful. If you are connected to the Zobel family, please email me. I am very generous with my research and would enjoy hearing from you. Mrs. Henrietta Zobel, nearly 95 years old, and a pioneer resident passed away last at her home, 182 Lincoln Street . The ... (unreadable in crease) caused her death. Mrs. Zobel was born in Germany on October 29, 1834, coming to Manistee April 16, 1872. She has resided here continuously since that date. She was married to Mr. Zobel in 1861. Mr. Zobel was a well-known merchant here, having a large store on River street. He preceded his wife in death eight years ago this month. Mrs. Zobel is survived by three children, Charles A., Henry, and Miss Ottilie Zobel, all of this city. She leaves 12 grandchildren, and 18 great grandchildren. Two sisters survive her, Mrs. August Guhse and Mrs. Amelia Angelhuber of Detroit. Mrs. Zobel throughout her life was a devoted member of the Trinity Lutheran church, and gave much of her time to church work. Services will be held Sunday afternoon at the home at 2 o'clock, from the Trinity Lutheran church at 2:30. Rev. J.H. Todt will officiate and burial will be in Trinity cemetery. I haven't done a Surname Saturday post for over two years, when I did the Glover surname. I decided it was past time to do another one. I chose my maternal Fredrick line this time. The spelling includes Fredrich and Fredricks. It will be a short list as I have only traced the line back to my second great grandfather. 1. Otto August FREDRICK: born 1 Nov 1878 in Manistee County, Michigan, United States; died 5 Feb 1968 in Onekama, Manistee, Michigan, United States. 2. Johann August FREDRICH: born 8 Jan 1845 in Prussia; married 8 May 1875 in Manistee, Manistee, Michigan, United States; died 27 Jan 1924 in Dickson Township, Manistee, Michigan, United States. 3. Christoph FREDRICH: married 1828; died 1861. Census records are some of the first records I search for when researching an ancestor. I have been doing a series of Where in the World? posts in table format to see where there are gaps in my research. This table is for Samuel Stillman Glover, my third great grandfather. 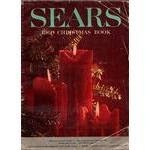 I remember the joy I would get as a child when the Sears Christmas Catalog arrived in the mail. I would pour through the catalog dreaming of all the things that I would like to see under the tree Christmas morning. The list usually included toys, games, and books. The list included jewelry as I got older. I thought their jewelry was gorgeous. I could spend hours looking at this catalog. I am sure by the time Christmas came the catalog was in pretty bad shape. I feel the same way about another catalog, the New England Historic Genealogical Society Books and Gifts one. The catalog has changed but my enjoyment of browsing it hasn't! Now, I could spend hours looking through this catalog. Times have changed and I view the catalog online, but my wish list isn't diminished because of this. I am not able to turn the corners of the page down or circle items, but I manage to pour through it nevertheless. This year's catalog did not disappoint. I would be happy with any of the books in the catalog. I think NEHGS books are of the finest quality. I have many in my library already, but there are many more I would like. I have been an avid reader for as long as I can remember. My dad took me to the public library for the first time when I was seven and I have been a lover of books ever since. I remember many bike rides to the library to check out books. I remember being excited whenever a Scholastic Book Fair came to school. I loved seeing the monthly Scholastic book flyer. Books were an important part of my childhood and it has grown just as I have grown. This year as I was perusing the catalog and NEHGS announced their book bundles, my husband suggested I pick a bundle I would like. He may have been sorry he said that because if I was picking a bundle, I was going big! I chose the Ultimate Robert Charles Anderson Bundle. This bundle has a price tag of $600 which would be way over budget for him to buy, but this would be a dream gift. I did chose other bundles number two or four and individual books I would like. Planters of the Commonwealth- This one will be under the tree as a gift from my parents. I would be ecstatic with any of the individual books in any of the bundles. 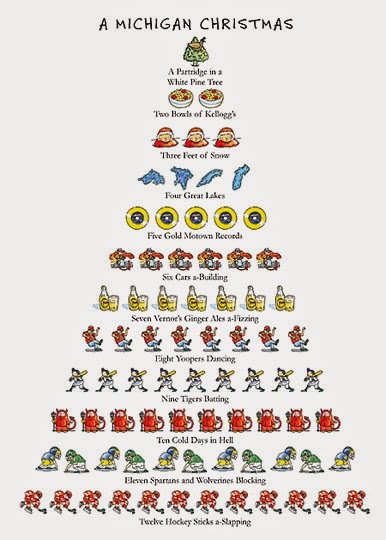 I have been a good girl Santa and can't wait to see what is under the tree this year. My interest in the Salem Witch Trials began after the Sarah Jessica Parker episode of "Who Do You Think You Are?" Ancestry sent an email that had a list of additional research sources for the episode. One I checked was the University of Virginia's library and their transcripts of the court records of the trials. 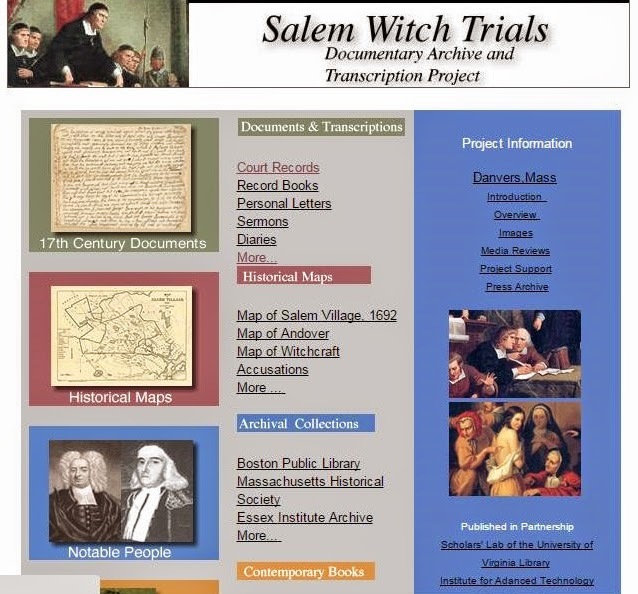 The University of Virginia has an excellent online collection of material relating to the Salem Witch Trials in their Salem Witch Trials Documentary Archive and Transcriptions Project. One will find documents, transcriptions, historical maps, archival collections, books and more at their website. I decided to look over the names of those involved in the trials and discovered that my eighth great grandmother, Mary Clements Osgood, was one of the accused. This was the first indication that I had an ancestor involved with the trials and to find out one confessed to being a witch surprised me. Of course, I was a little excited as it meant I could research this part of my ancestry. There was no better place to research from the comfort of my home than the resources of the University of Virginia. I immediately emailed my sister and she thought it was cool. Her other comment was "don't tell our husbands!" 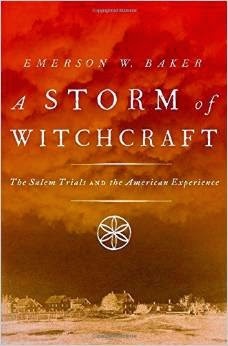 I scoured the library website and gleaned as much information as I could about Mary Osgood, but it wasn't until I read "A Storm of Witchcraft-The Salem Trials and the American Experience" by Emerson W. Baker that I truly understood the times which she lived and the hysteria surrounding the trials. My local library didn't have Baker's book so I asked my daughter, who lives in Chicago, to pick it up for me from her library. She brought it home when she came for Thanksgiving. I sat down to read it Sunday night and I was engrossed. I read it in three days. Originally, I wanted to read it to see if Mary Osgood was mentioned, which she was, but reading it took on a entirely different meaning as I read through this wonderful book. Baker weaves the history of the time with the relationships those involved in the trials had. There were many circles of the accused and Baker goes into detail on these circles. He explains the causes leading up to the trials and the turmoil the trials created. I knew my ancestor, Mary Osgood, had confessed and had imagined what would have happened for her to confess, but reading Baker's book explained much more than what my imagination envisioned. I took a few notes about those who confessed and discovered that those who refused to confess met death and not one who confessed in 1692 was put to death. Confessions were coerced by various barbarian methods, such as being forced to stand with arms outstretched with heavy shackles attached that eventually caused convulsions; having their neck and heels tied together until blood gushed from their nose; and in one case having heavy material placed upon their chest, crushing one. Those imprisoned were subjected to endless interrogations, sleep deprivation and strip searches. Mary Osgood was a resident of Andover, Massachusetts. Her husband, John Osgood, was a captain in the Andover militia, which as Baker explains was one of the reasons she was accused. Most of the witches accused from Mid July to September 2, 1692 came from Andover. 45 Andover residents were accused and all but six confessed. The story written by Baker is a fascinating one in itself, but he enriches the work by appendices and notes. Be sure to read these. Baker includes a list, compiled by Margo Burns, that lists each person and the elements of the trial which they endured. In Mary Osgood's case she went through examination, imprisonment, grand jury or indictment, jury trial, and restitution. No complaint or arrest, no conviction, and no execution took place of Mary. The notes provide numerous other sources, which I plan to check out, and are an important part of the book. I highly recommend reading this well researched, thorough examination of this period. I will leave you with one quote which sums up why I liked this book so much, Baker states, "Historians often dismiss the importance of genealogical research" and Baker uses genealogical research to explain what was happening during this tumultuous time in American History.